When you have a tree removed it is often an additional expense to remove the stump. As a result many owners will leave the stump. 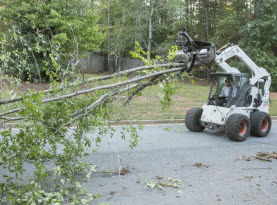 In addition, those that do their own tree removal often find they don’t have the tools or means to remove the stump. 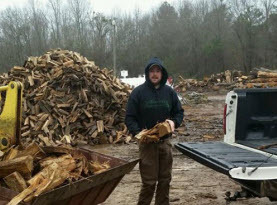 Many of us don’t consider removing the stump as a priority. However, we should. Removing the stump is very important for a number of reasons. 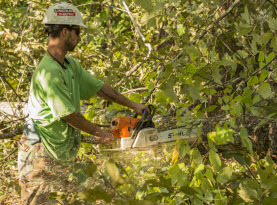 Milam’s Tree Service will share why you should have the stump removed. If you remove the tree are the roots dead? Only if the entire tree is dead and was removed for that reason are the roots of the tree actually dead as well. If you have a tree cut down and it still has living roots, the tree will continue to spread and grow. New growth from the stump will begin to manifest, or some species of trees will spring out from the roots and begin growing a new tree. Your reasons for removing the tree will vary. However, a new tree that continues to grow often continues with the same problem as the tree that was cut down. The roots can continue to grow. Unfortunately, they can grow toward the plumbing and will break the piping or even damage the foundation of the home. The only way to get rid of a tree is also by removing the stump which is the core of the roots. Pests will also inhabit tree stumps. Pests such as termites and carpenter ants love to make their nests in tree stumps while feeding on decaying wood. Stumps often become a welcome mat for termites and carpenter ants. As the wood of the stump dries, the easier it becomes for termites and carpenter ants to crew on the wood. Where you might feel like your home is safe, the termites or carpenter ants are happily living in the stump. Their presence becomes problematic during the spring season. Both termites and carpenter ants have reproductive members of a colony. Come the spring these reproductive members, called “swarmers,” leave their nest, mate and seek out a new places to begin their own colony. These swarmers can easily make it into your home and begin their own colony inside your home. To prevent an invasive species that can cause thousands of dollar worth of damages in your home it is wise to have the stump removed. Decaying roots and stumps can also cause or harbor disease and fungus that can spread to the other trees near the stump. Some parasites can also infest the stump which could have resulted in the tree death and spread to other trees and plants. There are many different types of beetle, such as the Asian Longhorn beetle, that is a known species here in Georgia who is responsible for killing thousands of trees. While some pests don’t hurt trees themselves, they can carry diseases or fungi that can be harmful to the trees. There are many insects species that invade trees and may remain in the stump. By having the stumps removed, it helps prevent the spread of pests and diseases that are carried by pests. – Replanting is easy as the hole is already there! 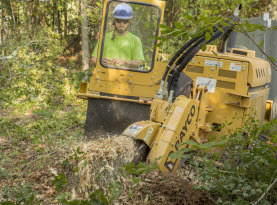 If you have old or new tree stumps and you need to have them ground or removed, contact Milam’s Tree Service and schedule our services today.